Safe – Non Radioactive Enzyme activity assay. Homogenous – One-step, no wash assay. FAST – Results in 30 secs – 5 minutes. We have developed a highly sensitive, very rapid, extremely simple assay for AChE activity, using the natural substrate, acetylcholine. As shown in Figure 1, a series of coupled enzyme reactions quickly translates the presence of active AChE into a change in the luminance of the reaction. First (reaction I), acetylcholine is hydrolyzed by the AChE to yield acetate and choline. The acetate and choline then enter a coupled enzyme reaction (reaction II) that results in consumption of ATP, and finally the ATP concentration is measured by the well-established luciferase method (reaction III). These reactions can occur simultaneously, and the result is generally obtained in five minutes or less. Inhibitors of AChE are readily detected by an increase in luminance due to reduced consumption of ATP. Figure A. Tacrine (a mixed-mode inhibitor of AChE) was serially diluted in DI water. Next 10mL of the diluted Tacrine (x axis labeling represents mM final concentration of Tacrine) was added to a white opaque 96-well microplate along with 50 mL of component A (AChE enzyme). The samples were incubated for 5 minutes after which 50mL of component B was added to all the wells. Data were collected using a luminometer. Data shown represents T=2 minutes after the addition of component B. 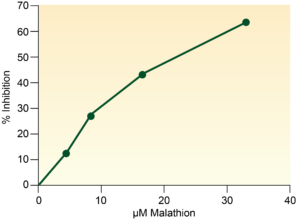 Figure B. Malathion, a common pesticide, was first diluted in DMSO and subsequently serially diluted in Di water. 10μL of the diluted Malathion (x axis represents μM final concentration of Malathion) was added to a white opaque 96-well microplate followed by 50 μL of component A (AChE enzyme). The mixture was incubated for 15 minutes, after which 50 μL of component B was added to all the wells. Data were collected using a luminometer. Data shown is at T= 5 minutes. 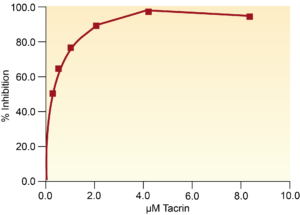 Data shown represents T=2.5 minutes after the addition of component B. (HA Berman and MM Decker. Kinetic, equilibrium, and spectroscopic studies on dealkylation ("aging") of alkyl organophosphonyl acetylcholinesterase. Electrostatic control of enzyme topography. J. Biol. Chem., Aug 1986; 261: 10646-10652 . Schallreuter KU et al. Activation/deactivation of acetylcholinesterase by H202: more evidence for oxidative stress in vitiligo. Biochem Biophys Res Commun. 2004 Mar 5;315(2):502-8.